Never start a new TV show before going to bed, it’s the worst! When the show is good, you can’t help but press play for the next episode and the next thing you know, it’s 3 am and your brain is navigating somewhere between auto-pilot sleepiness and excitement for “who is the murderer?” Then the next day, when your human alarm (aka my beloved baby daughter) wakes you up at 6 am, you feel quite stupid for succumbing to TV on demand. But no regrets, because now, I know who is the murderer. A few weeks ago my friend Tania dropped by and brought a good kilogram of fresh figs with her. After a few days of eating them with baghrir and amlou for breakfast, I was in the mood for something savoury. So, obviously, I asked my friend Google and then I told myself, “OMG I should just make a tagine with them”. 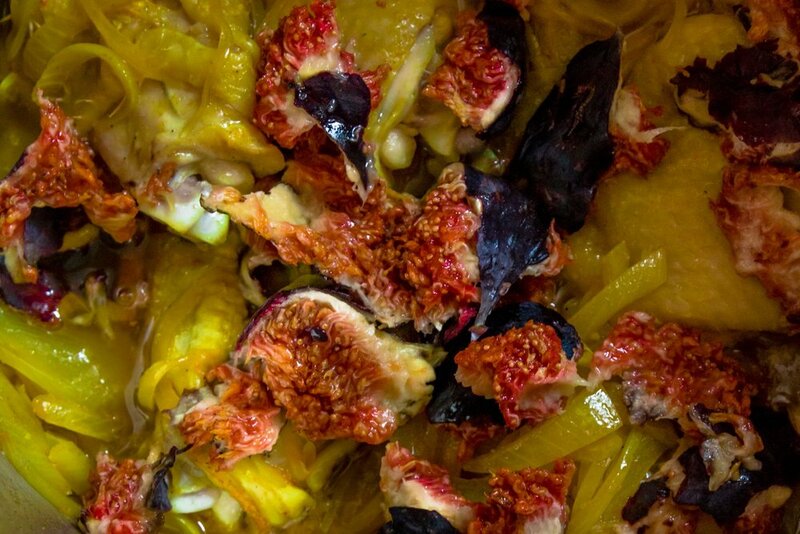 A few days later this tagine was born, it’s good and comforting and literally the best way to make the best out of your ripped figs. I rarely use fresh fruits in my tagine, most of the time I use dried ones. 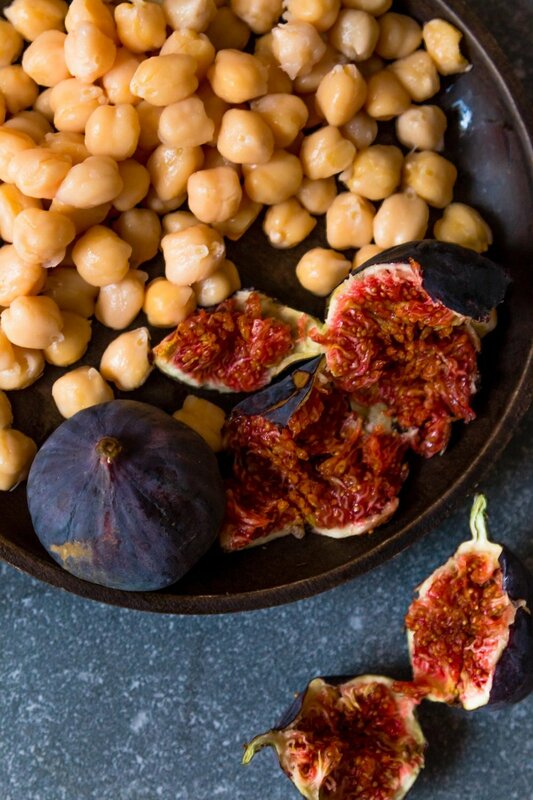 The result with fresh figs is very interesting and not as sweet as with dried fruits, it’s definitely more savoury than sweet and has this subtle and delicious after taste of fresh figs. Really, really delicious. • In a large saucepan add the olive oil over medium heat and add in the onions. Cover with a lid and leave until the onions are soft and translucent, 15 to 20 minutes. Stir occasionally. Add in the garlic, turmeric, ginger, salt and black pepper into the saucepan and cook for 5 minutes stirring occasionally. Place the chicken inside the saucepan and pour in the chicken stock. Reduce the heat to medium-low, cover with a lid and leave to simmer gently until the chicken is almost cooked, about 45 minutes. 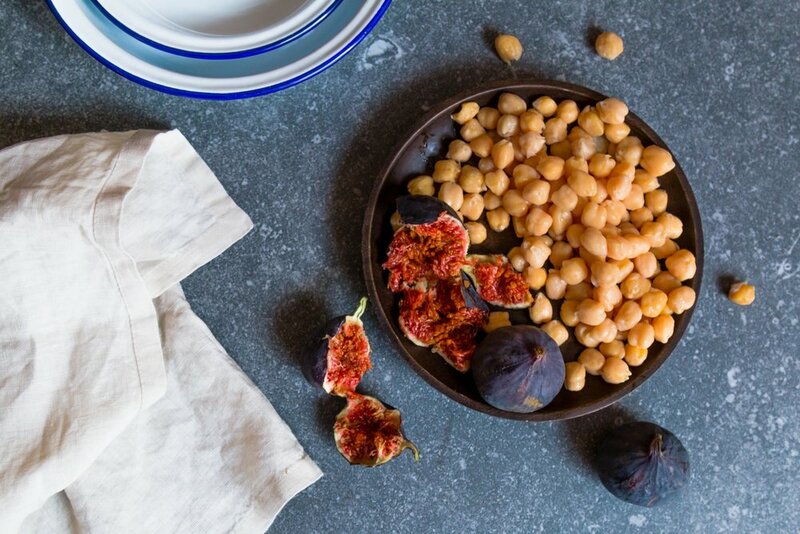 • Stir in the chickpeas and the fig pieces and give a good stir to the content of the saucepan. Leave to simmer until the chicken is fully cooked, about 15 to 20 minutes. If at any point throughout cooking it seems like there are not enough liquids in the saucepan and the tagine is drying out, add in a couple of tablespoons of water. • Garnish with chopped coriander and serve immediately with crusty bread, rice or warm couscous.